I was browsing through articles recently about interesting things to do with Thanksgiving leftovers — Canadian Thanksgiving was over a month ago, but the American one was just last week, and it seemed like every cooking blog on the Internet was talking about it. 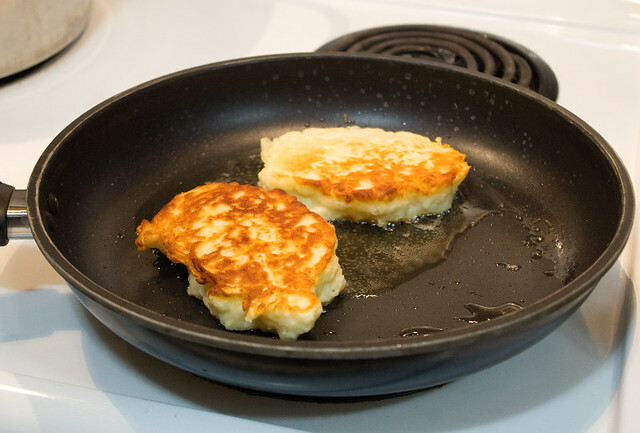 One of the websites (and I’m sorry that I can’t remember exactly which one, but there were so many) suggested using leftover mashed potatoes to make boxty, or traditional Irish potato cakes. 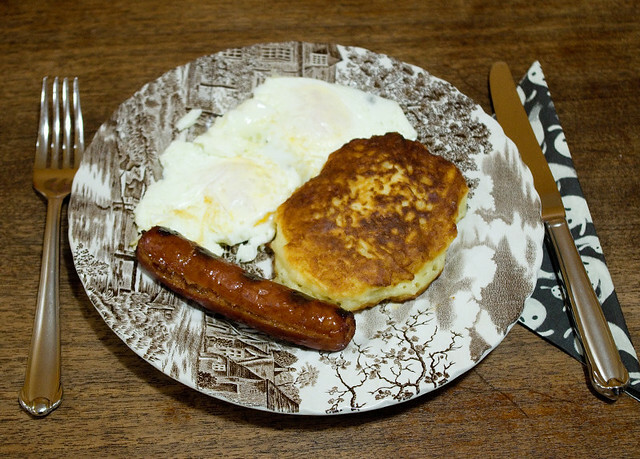 The IrishCentral recipe looked pretty straightforward, so I had to give it a try. Although it’s not something we ever ate at home, my mother has been raving about boxty for years because there’s a local restaurant that serves it. Apparently the version she had is served with roast beef that is marinaded for twenty-four hours in some kind of whiskey sauce — which honestly sounds delicious, but I didn’t have the ingredients at home. Other topping suggestions I found online were butter and sugar, jam, fresh berries, sour cream and chives, butter chicken, creme fraiche and caviar, smoked salmon and whipped cream cheese, whiskey and mushroom gravy… The list goes on. Basically, boxty can be eaten plain or can be used as a base for sweet or savoury toppings, much like rice or potatoes or bread can be. Personally, I think I’d like to try it as the base for an open-faced hot roast meat sandwich with gravy made with leftovers after a traditional Sunday dinner. Sadly, we didn’t have any roast in the fridge today, so I had to make do with ingredients that wouldn’t take me another day’s worth of cooking to prepare. I served the boxty with eggs sunny-side-up and Andouille sausages. When I tried the boxty dipped in the egg, I discovered that I’d definitely tried this flavour combination before; my husband’s family likes to throw leftover roast potatoes (chopped) into an omelette, and of course that tastes like potatoes and egg, much like the boxty dipped in egg. It seems really obvious when I write it out like this, but it took me a moment to realize why the flavour was so darned familiar! Everyone in the family really liked the boxty and requested that I make it again. I honestly wish I’d tried it before! The kids especially liked theirs dipped in maple syrup much like a regular pancake, which is a very Canadian way to do it. In the future I think I’ll try making some of the other topping variations. There are so many delicious-looking ones, though, that it’ll be hard to decide which one to try first!